I had made a number of iterations of the base for this miniature, including one with a wall behind the duo, but it just wasnt working for me, so right at the last minute I decided to build a new one! I wanted something more open but still framing the miniature, so went for some steps and a pair of columns. The columns are plaster of paris from a Hirst Arts mould, and the steps are made from blue extruded polystyrene ‘sculpted’ with a dental too. I managed to finish the model the day before Euro, and added the finishing touches the morning I left for Folkestone… but it was worth it! 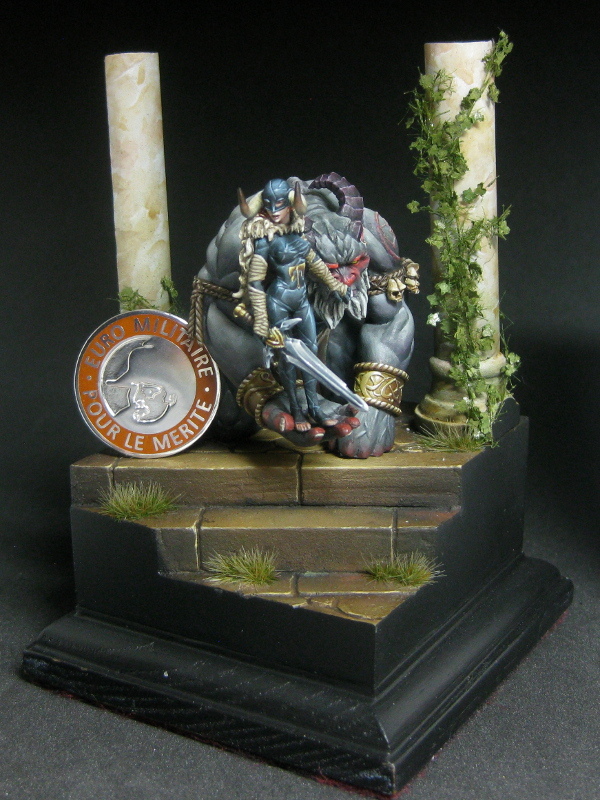 I entered the piece into the painting competition, and after an anxious morning I was absolutely delighted to see that I had won a Bronze medal with the Ogre Dominator!